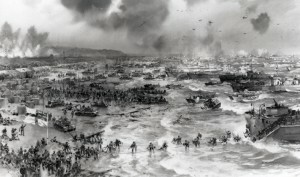 World War II was waged on land, on sea, and in the air over several diverse theaters of operation for approximately six years. But it is the images, photos, movies and film of our soldiers, our heroes, our sons, storming the beaches of Normandy, France that made the most impression on me as a child. The horrific images of bullet-ridden young men collapsing in the water and on the beaches of Normandy are forever seared in my memory. 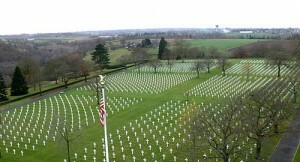 In August of 1995, I took a trip with my husband to Normandy France to commemorate the 50th Anniversary of World War II. It was a trip that not many Americans take. Those who do make it to France are mostly too busy whooping it up in Paris, or Cannes on the French Riviera to care about a little region like Normandy. I will never forget standing on the bluff that foggy, rainy, and bitterly cold day. I imagined that the weather the morning our soldiers stormed those beaches was probably very similar. As I reverently walked along the fog obscured cliffs and looked down at the desolate Omaha Beach, what shocked me the most was their impossible-to-climb steepness—over 1,600 feet. 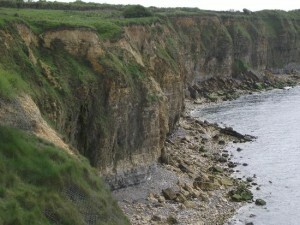 How could our soldiers have possibly scaled those fearsome and heavily German defended cliffs? 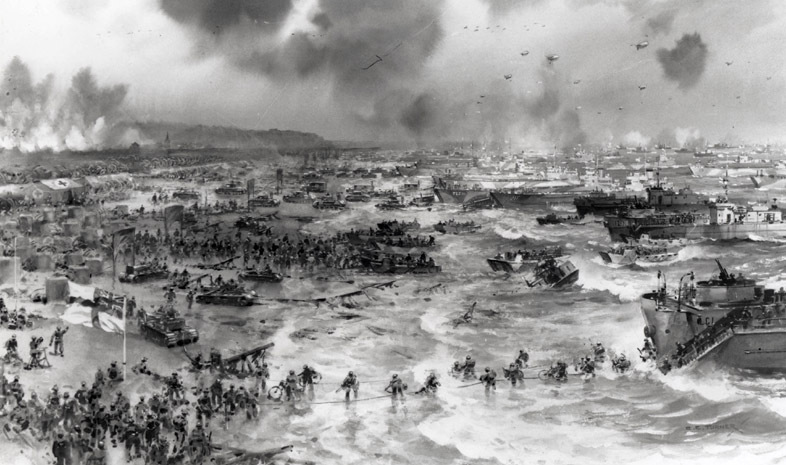 History has taught us that sadly, many of those brave young men who stormed the beaches early in the morning of June 6, 1944, lost their lives on that fateful day. Omaha was the bloodiest of the D-Day beaches, with roughly 2,400 U.S. troops turning up dead, wounded or missing. The rough surf wreaked havoc with the Allied landing craft and only two of the 29 amphibious tanks launched at sea managed to reach the shore. 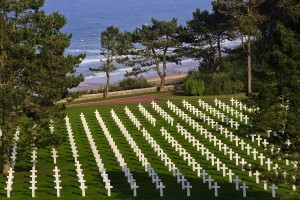 As I gazed at the choppy waters beyond Omaha Beach, bound at either end by large rocky cliffs, I sadly envisioned those brave young men wading through neck-deep water to a shore many would never reach and who gave all they had for liberty and justice. Overlooking and looming over the crescent shaped beach behind me lay a peaceful, eerily quiet lawn of thousands of their headstones. The meticulously manicured and immaculate grassy grounds with row upon row of white headstones in perfect alignment was humbling and devastatingly moving. The Normandy American Cemetery and Memorial house the remains of 9,387 of our military dead, most of whom lost their lives in the D-Day landings and ensuing operations. Three hundred and seven of those interred are “Unknowns.” There are three Congressional Medal of Honor recipients, four women, a father and son, and 33 pairs of brothers. The servicemen and women laid to rest there came from all fifty states and the District of Columbia. 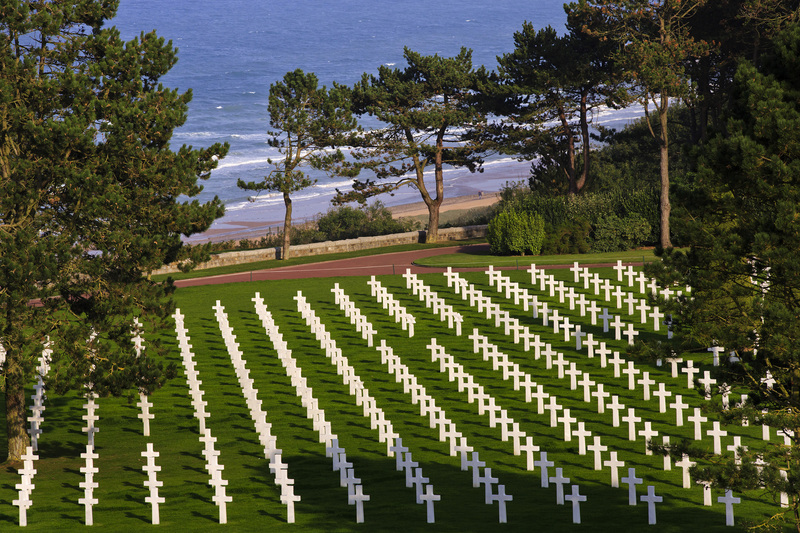 The spine-tingling cemetery overlooks Omaha Beach and its main paths are laid out in the form of a Latin cross. The site of perfectly aligned headstones on the pristine emerald green lawn sent a chill through my body that I can still recall today. Each grave was marked in snow white marble—a Star of David for those of the Jewish faith, a Latin cross for all the others. Nothing could have prepared me for the emotion I felt as I took in the serenity of the hallowed resting place for those valiant soldiers, the majority of whom were still in their teens, who made the supreme sacrifice for the cause of freedom. I realized as I stood with my hand over my heart while the national anthem and taps played in the background, that there would never be another place that would evoke such an awe-inspiring and life-changing effect on me. And I will never forget the respect, gratitude and immense feeling of pride I felt to be an American. In the Garden of the Missing, there was a wall inscribed with 1,557 names. Those heroes who gave their lives in the service of their country but whose remains have never been recovered or if recovered have never been identified. THIS IS THEIR MEMORIAL THE WHOLE EARTH THEIR SEPULCHER. COMRADES IN ARMS WHOSE RESTING PLACE IS KNOWN ONLY TO GOD.